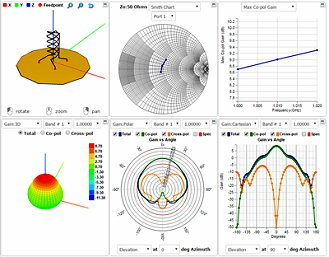 A Microwave Journal technical education webinar will highlight the use of NI AWR software products specifically Microwave Office circuit design and AntSyn™ antenna synthesis and optimization software, for designing a compact internet of things (IoT) dual-band Wi-Fi multiple-in-multiple-out (MIMO) array antenna. Presented by Dr. Derek S. Linden, director of technology for AntSyn at AWR Group, NI, the webinar will describe how to determine the initial specifications, explore the design space, and obtain optimized antennas from the synthesis tool. Attendees will also learn how to import the antenna geometry and materials details into a circuit design environment to explore and verify performance, as well as prepare the antenna design for production and prototyping. Advanced topics such as phased-array and multi-function antenna design will also be presented. For details and to register, visit "Antenna Synthesis for IoT MIMO" webinar. Since 1976, NI has made it possible for engineers and scientists to solve the world's greatest engineering challenges with powerful, flexible technology solutions that accelerate productivity and drive rapid innovation. Customers from a wide variety of industries - from healthcare to automotive and from consumer electronics to particle physics - use NI's integrated hardware and software platform to improve the world we live in.